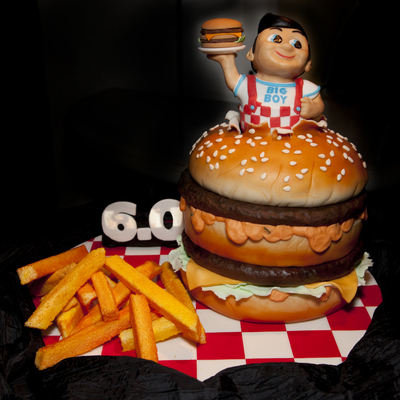 This cake was for my buddy's 7 year old daughter Kate. Last year I made her a Minnie Mouse cake. This year she wanted Marie, the white kitten from the Aristocats. The pillow is a white cake on a rice krispy treat base. Marie is solid fondant. 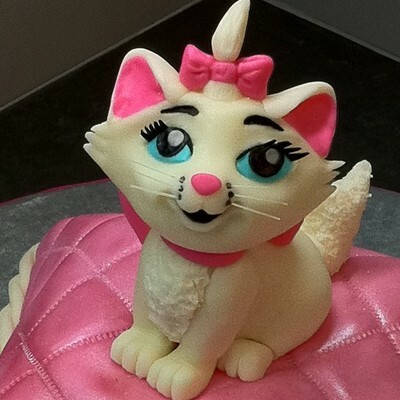 Her whiskers are pulled isomalt. 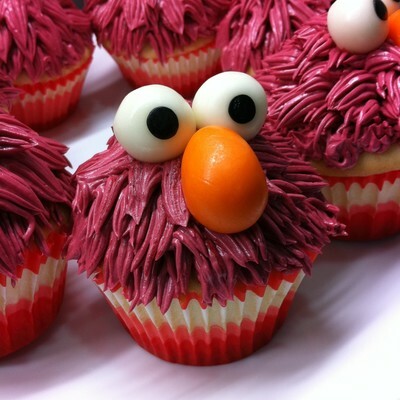 Her eyelashes were cut from black frosting sheet. 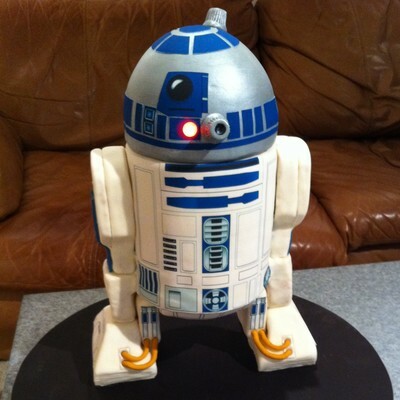 This is a chocolate cake covered in fondant then airbrushed. 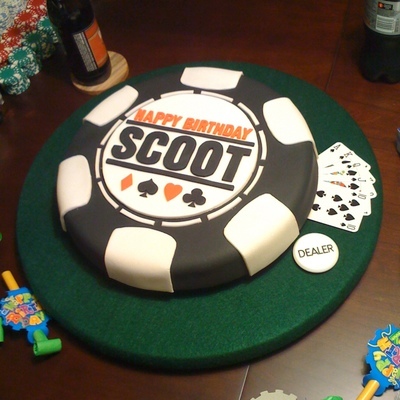 It was a 40th birthday cake for my friend Scott, who is a big steak fan. 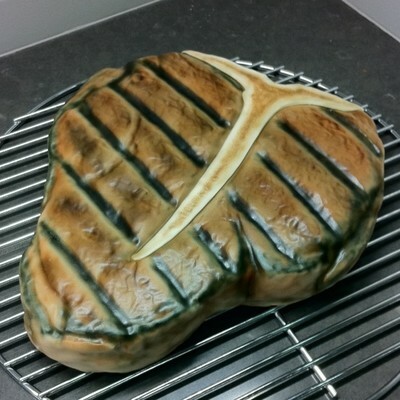 I presented it in a tiny charcoal grill with a battery powered light placed on the bottom. Then I put dry ice in some water under the grill to make it smoky. Dogga is my buddy's son's favorite stuffed animal dog-- he carries it everywhere. He also likes soccer. So I made a cake with Dogga balancing on a soccer ball for his 4th birthday. The ball and Dogga rotate on a motorized platform. 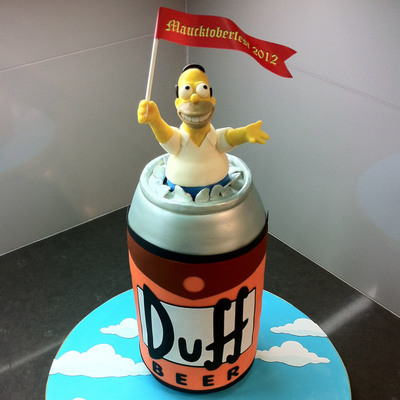 The cake is a 2-layer chocolate/yellow cake with vanilla buttercream, covered in Duff fondant. Dogga is fondant over copper wire. 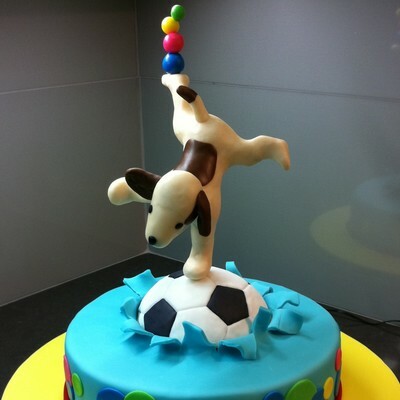 The soccer ball is RKT molded in a 6" ball mold, covered in Wilton's fondant. I made this groom's cake for my best friend's wedding. Oski is the Cal Bears' mascot. He's relaxing on a carrot cake couch watching a working flat screen tv. 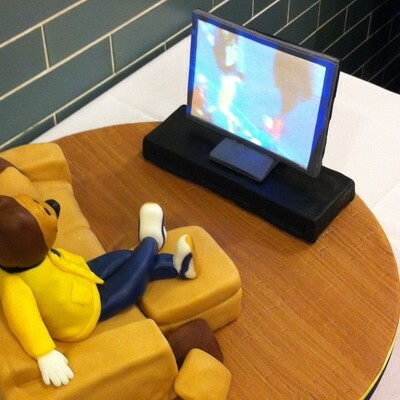 The tv is gum paste and fondant, with the video projected onto it by a laser pico-projector hidden under the base. There's a laptop under the table, driving the projector. I made this for my buddy's 6 year old daughter. This was my first attempt at a tiered cake-- based on many Minnie cakes on CC. 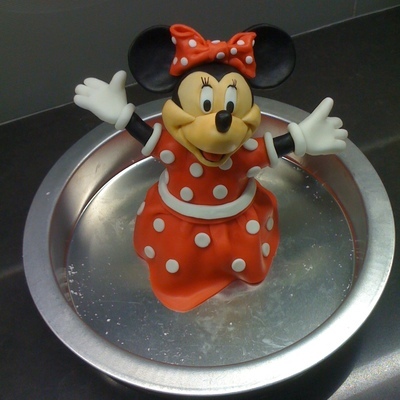 But I added my twist of the 3D fondant and RCT Minnie Mouse popping out of the top. That part was inspired by a dragon cake I saw from Mike's Amazing Cakes. I used a Cricut Cake to cut out the text and the Minnie icons around the bottom tier. I'm really pleased with the way the 3D Minnie turned out. It was my 3rd try making a Minnie out of fondant. This time, I tried to make the hands and face more expressive. The final assembled cake had stars around the back of Minnie, but I don't have any pictures of it-- I did the final assembly at his house. 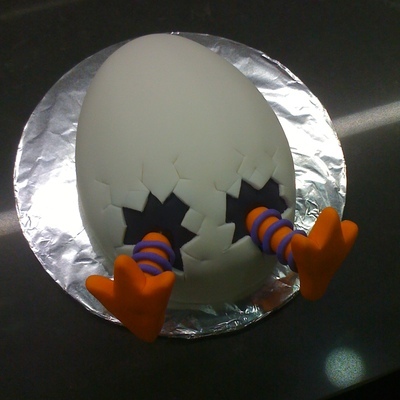 After seeing my Big Bird Easter cake, my buddy's daughter wanted me to make her birthday cake this year. 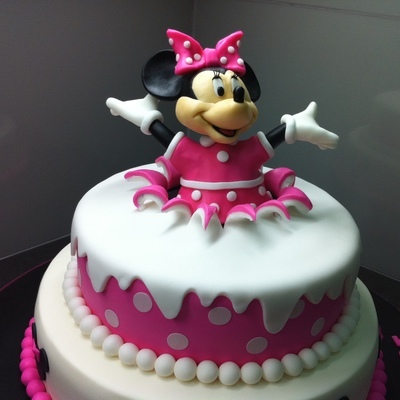 So I'm making a Minnie Mouse popping out of a cake, inspired by an awesome dragon cake I saw from Mike's Amazing Cakes. But I didn't want to ruin her birthday with a lame cake. So I did this practice Minnie to make sure it'd look alright. It's all Fondariffic (black, red, and ivory colored buttercream) and Wilton's (white only) rolled fondant. The only inedible parts are the dowel backbone, some wire in the arms, and the eyelashes (black paper). It took 4 hours start-to-finish, but this is the first time I've tried Fondariffic. (It's really soft in this California heat!) Her dress isn't great, but the head and hands turned out better than I expected. 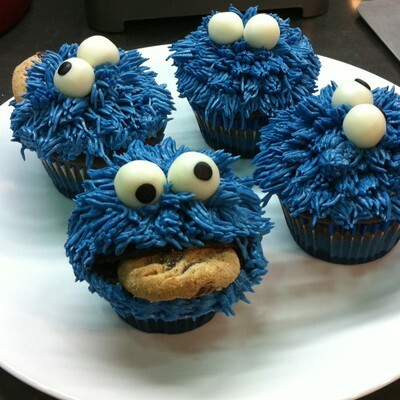 I'm trying to bake a cake every month, using a new decorating technique each time. This one used my Cricut Cake for the first time. I made this one for my LOST finale party. 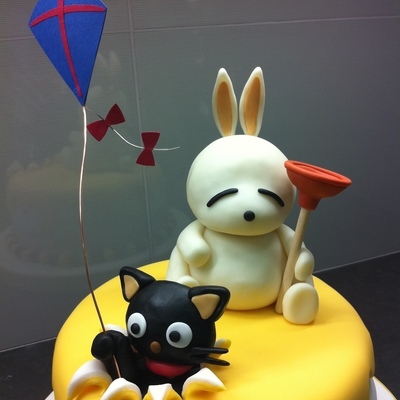 It's fondant over chocolate cake, with buttercream filling. 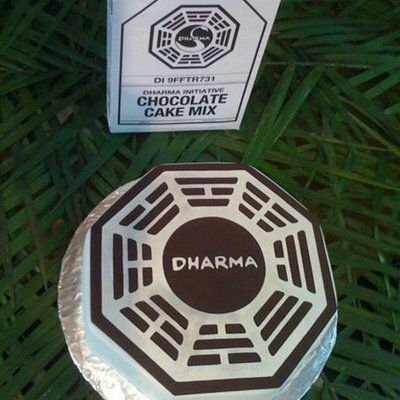 The Dharma logo is a brown frosting sheet with a white frosting sheet on top. I used Sure Cuts A Lot 2 software and a laptop running Vista x64 to cut out the logo. I found the logo online as a TTF font that someone made. It's amazing what you can find online. This was my first attempt at using fondant. 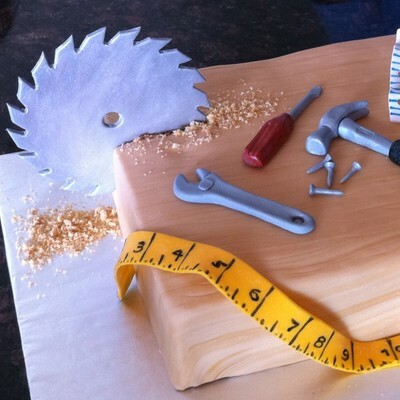 I've seen every episode of Ace of Cakes and Cake Boss, and thought I'd give it a try. This was based on a cake I saw on Google-- a take on the "World Series of Poker" logo. I think I'm hooked... found a new hobby.